Previously in this narrative, I shared the story of seeking cheap Yankees tickets online for Derek Jeter’s big 3,000th-hit game at new Yankee Stadium, to no avail. 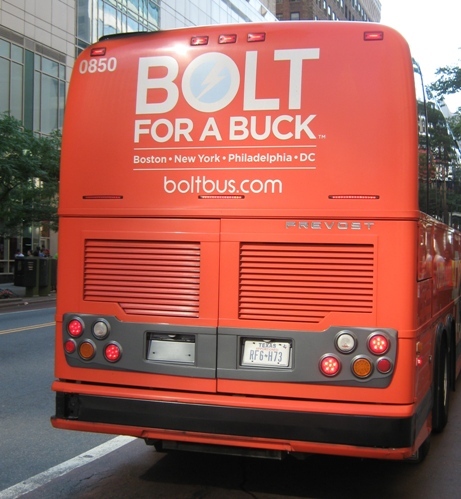 But despite my lack of success, I decided to get on the Boltbus to New York City and further push my luck. As documented, yours truly at least managed to get to New York City inexpensively, in no small part by avoiding parking at Yankee Stadium. But the larger problem of lacking a ticket to enter remained. Upon arriving in Manhattan I decided to try Modell’s in Times Square. 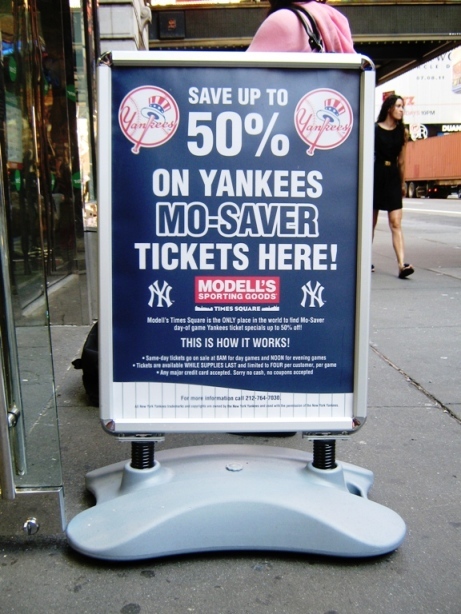 Modell’s and the Yankees have jointly found a way to unload some unsold seats, by offering them at half price on game day. 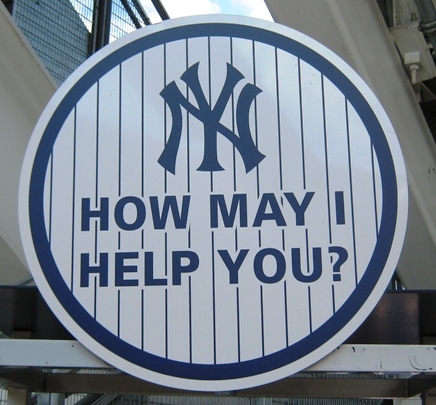 (This tip is included in the Yankee Stadium E-Guide.) They are based on availability, however, meaning my chances of landing a ticket for under $40 were, of course, slim. Well, at least I got a picture. Get a $400 ticket for $200! Yankee Stadium Tightwad Tip #3: The Modell’s in Times Square does indeed have Yankees tickets available on game day, even for prime games, but you will not often find the lower priced seats. But, if you do want the premium seats, there will probably still be plenty available, and at half of the extensive price. For that, Modell’s is worthwhile. Plan C now. I took a walk over to 6th Avenue to get the D train, the weekend express train that flies north to the 161st St.-Yankee Stadium station. I exited the subway and there the gorgeous monument to baseball dynasty stood. Already people were setting up shop…parking signs were being put up, hot dog carts were already peddling, and the beautiful hot morning already had the air of a day of baseball. The first stop was at the game day window at Gate 4…or more correctly the line for the game day window, which stretched a good half a block to Jerome Avenue. Evaluating the situation, I decided that this was not worth the risk, and that other avenues needed to be exhausted first. Which they would. 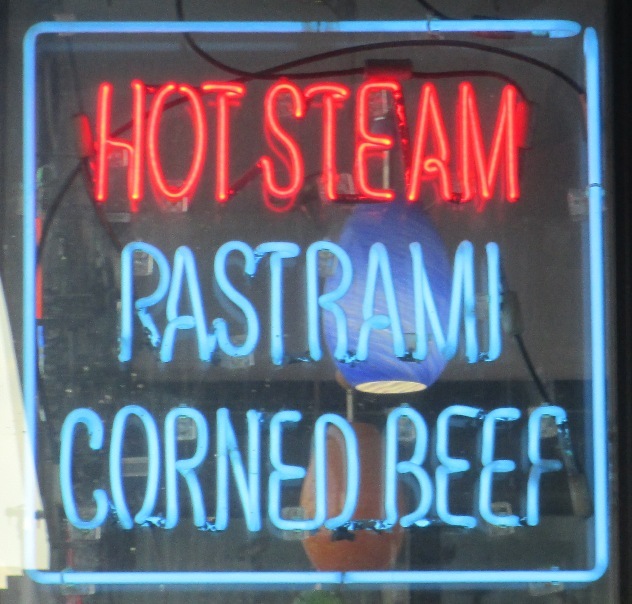 I’ll have the hot steam please. By this point hunger was setting in, a condition inexpensively cured with a sandwich and a knish from the Court Deli, a couple of blocks east of the ballpark on 161st. 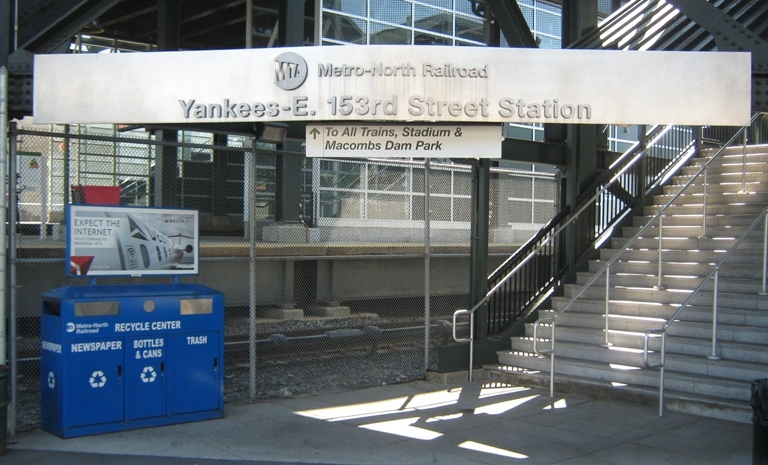 So while passing the time I took a photo-op at the 153rd Street-Yankee Stadium Metro-North Station, which was built along with the new Yankee Stadium to provide a rail option from northern suburbs. The new station is impressive, with a great view of the Stadium, and is just a short walk through Macombs Dam Park to the House That Jeter Built. This sign probably cost about $1 million. Unfortunately, fans had not yet started arriving on this route. I thought this might be my best chance to find unhardened suburbanites eager to rid themselves of extras, but found only a few folks headed to the game. Still early. At the bottom of the platform exit stairs were two attractive women representing Stan’s, the nearby sports bar that is a favorite of ballgame goers. 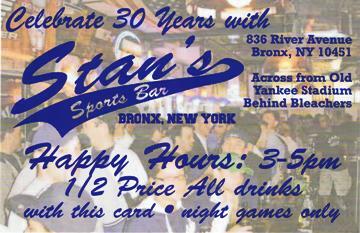 They handed me a card advertising their specials– $3.00 drafts during the 7th and 8th innings of the game. All well and good, I said (actually I think my exact words were “Woo-hoo!”), but does Stan’s have extra tickets? The ladies wordlessly turned their heads in the direction of a scalper standing right there. Who, of course, seized on the opportunity to skin the vulnerable dreamer alive, showing me a ticket he just happened to have for sale. More than one Happy Hour! The correct date, a decent seat, and he made sure I recognized that this was a valid ticket. The face value was $45. “How much?”, I asked, solely to get a sense of the market. Well, at least he was looking out for me. Ballpark E-Guides Tightwad Tip #4: Try to find someone looking to get rid of extras before you patronize scalpers. Scalping is illegal in most states, so you shouldn’t be doing it anyway, but people with extras are far less likely to gouge you. The scalpers in NYC especially are professionals, they do this every night, and they know exactly what they can get for a ticket from an eager fan. Someone with an extra usually just doesn’t want to eat it, so offer a fair price for it…don’t insult them. They may be doing you a big favor. Now at least I knew where the market stood: three times above face value, and not likely to go down before the game started. 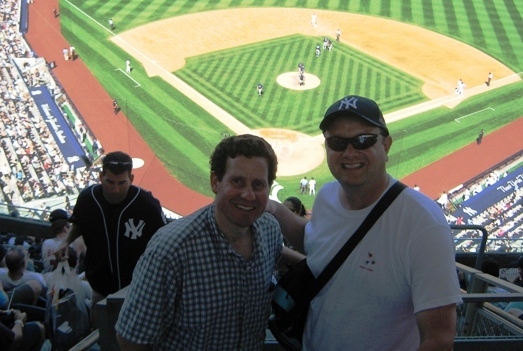 Gary Herman has been to more Yankees games than I’ve been to games. About this time I met up with Gary Herman, he of Royalty Tours USA. Gary has seen an average of 350 sporting events a year for many years now, and he documents his experiences on his blog, including some helpful tips that have found their way into E-Guides. If there’s a Guinness record for this kind of thing, Gary has to be a candidate, and most amazingly of all, he pulls all this off while working a full time job and not being independently wealthy. By this time, somehow, the game day window crowd was separated from the exchange window, and now the line was down to only about 20 people. Gary stood with me in line, both of us knowing that it was a long shot for me to get a ticket, and Gary promising that he could get a ticket for me next time if I need it. Before I could begin working on Plan D, Gary taps on the window and pesters the agent a bit. “I just saw two kids leaving with 30-dollar tickets. You don’t have anything?” The agent tries again. I am ecstatic. I gleefully hand over the credit card, take the ticket, sign the receipt, thank the agent profusely, and Gary and I leave the window and head for the food joints on 161st, ear-to-ear grin on my face. I’ve won. Nothing could go wrong now…right? Uh-oh…what’s with the ominous tone at the end of what should have been a triumphant victory for the tireless author of Ballpark E-Guides? Did Kurt get carsick? A hangnail? Second thoughts? What could have gone wrong? Click here for the third and final episode of Kurt’s Derek Jeter Day Adventure!